Like many Eagle River Alaska residents, this homeowner lives at the top of a slope. The area is quite mountainous, with many slopes and switchbacks. Most of the homeowners have small backyards that back up to rising slopes as well, or their front yards overlook these hills. The terrain and natural setting makes Eagle River a beautiful and desirable place to live. But not only is outdoor living space limited, there are other issues like water runoff and encroaching mountains. 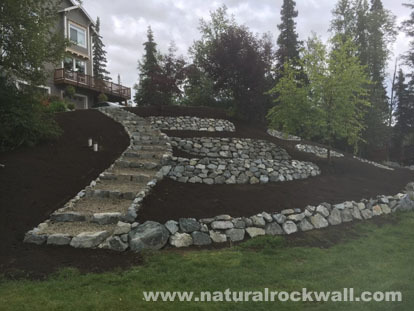 Rock Landscaping has been helping Eagle River residents address these issues for decades. Prior to this project, the front yard was essentially large mounds of dirt and weeds, and an uneven grade. Rock Landscaping cleaned up the slope and created a smooth even grade for a front lawn. We then built a natural stone staircase for access to the lower lawn from the driveway, and added retaining walls. The natural rock retaining walls were designed to keep the new lawn from eroding away, but the homeowner plans to use these new spaces for decorative purposes as well. We designed and built smaller walls with shelves that will hold half wine barrels filled with topsoil and flowers. Meanwhile the larger retaining walls in front have two feet of topsoil behind each that will provide space for more flowers and other plantings. The homeowner plans to plant the rest of the lawn with grass. Want to discuss your retaining wall or grading project? Contact Rock Landscaping and we will be happy to give you answers to your questions. We provide services throughout the Anchorage area.